Market Basket and Coca Cola will present four Texas residents with $10,000 in groceries in celebration of their 51st Anniversary in May. The grand prize winner, Marilyn G. of Beaumont, will receive $8000, Dorothy B. will receive $1000, and both Denise S. and Clara W. will each receive $500. “A strong belief in community drives Market Basket to continually strive to improve our customer’s shopping experience,” states Skylar Thompson, President. For that purpose, the Lavaca location in Beaumont was recently remodeled using a vibrant Lamar University theme to reflect community pride. 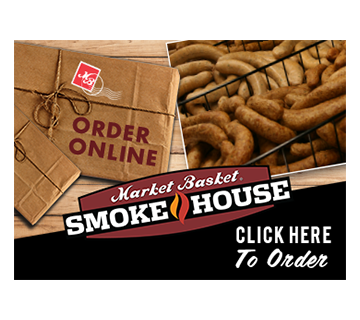 The addition of a Market Basket Smokehouse at this location offers customers at all stores the opportunity to enjoy Market Basket’s own unique sausage and boudain. A recent remodel of the store located at Major and Phelan enhanced the shopping experience at that location with new décor, improved lighting and an updated frozen foods section. Market Basket is a chain of 34 family owned and operated independent grocery stores in Southeast Texas and Southwest Louisiana. Co-founded in 1961 by Bruce and Alletta Thompson, the company recently celebrated its 51st Anniversary. Market Basket continues to grow each year by adding new locations and remodeling existing locations, showing their commitment to continued growth and excellence of service to their customers. For additional information about Market Basket, please visit www.marketbasketfoods.com.